It was good for email and text messages and voice calls but that was it. Or you could have a Blackberry which was good for email and text messages and voice calls but again that was it. Basically, they were work devices with little appeal outside the corporate environment. This was just as well because they were mighty costly to buy and even more expensive to run. Enter the iPhone and everything changed. One big button on the front, one huge screen and that was about it. You could buy apps, you could install music, you could watch video. Forget buttons, a clean screen was where it was at. And so we have stayed since then and while we've seen huge growth in the number of units world-wide, and a huge growth in the size and capability of the devices, that basic model has stuck. Today, Nokia is a novelty item and BlackBerry may as well not exist at all. If it's not Apple, with around 50% market share, it's a device running Google Android, also with around 50% market share. What is evident is that network operators are also on a hiding to nothing. They're expected to buy spectrum rights, build a network and offer faster connection speeds for … less money than they currently charge! It's an entertaining model for sure but that's what they do and long may it continue. I now pay about $70 a month for a service that offers unlimited local calls, unlimited mobile calls, unlimited text messages and a fair swag of data to boot. I don't think about my usage, I just make calls. A decade ago I was paying the same and checking my balance like a student every time I used my device. It was ghastly. The telco market has changed out of all recognition since Apple launched the iPhone and it's going to change some more, but I wonder if it's ready for it. Ten years from now I suspect the customer won't have a clue whose network they're connected to. They won't know or really care - so long as it functions, it's all good. This week's announcement from Apple about the launch of eSIM cards is the start of the end for the telcos. Once we're used to having an electronic or virtual SIM card, an app will appear in the store that lets us migrate our phone from one provider to another on a whim. Wake up and your phone may tell you "I see you're off to London today on the direct flight so I'll port you to PomTel for the day, and then when you come back we'll see which offers the best price" or similar. Or you could chose to always have the best quality network. Or the one with the best data price. It's up to you. Of course, the telco number portability process won't cope with such agility, but that's not the user's problem. No no, far from it. Apple has already driven a wedge between customer and telco. In the old days you were a network's customer and happened to use a device from Alcatel or Ericsson or Nokia or whomever. You could swap devices as easily as you could underwear, but swapping networks was hard. Today you're an Apple customer or an Android customer and swapping networks is simple but swapping operating systems is hard. The telcos that survive are the ones that jettison their marketing departments, their fluffiness, their consumer-friendly content marketing schemes and who move swiftly to becoming a quality network operator. The telco of the future is a commodity and is a dumb pipe and for the consumer, that's a good thing. Techblog - Apple launch snooze fest oh hello, what's this? It comes for us all and while the telco sector is still feeling it, as is the media, disruption is bound for other sectors too. Fonterra could, I feel, benefit from a bit of disruption. If they'd like to employ me as CEO with a remit of "not losing $200 million in a year" I feel I could give it a serious go for roughly half of what the current chap is on. Cheap at half the price I say! But of course the next CEO won't only have to deal with restructuring the 6000 staff who earn more than $100,000 a year (not to mention the 24 who earn more than a million) but also the move to artificial protein that is about to come down the pike towards Fonterra's bottom line. Why buy in milk powder when you can build your own? But let's not be too smug, you bankers, with your billion dollar profits and your closing of the local branches. Sure, you make sure everyone's dosh is secured safely, and our houses are all mortgaged up the wazoo, but what are you going to do when my kids arrive at your door asking for a mortgage but don't have a single income model for you to assess? How will you cope with a client base that has half a dozen part time roles, owns a company and is invested in a lifestyle that is alien to your actuary tables? And that's before we all move our accounts online and decide not to bother with a bank at all, but rather some kind of online service that lets us get a loan from a provider in Uzbekistan, which is delighted to offer us money at a low rate, and put our savings in a bank in Bermuda that offers a great return. And while we're pointing at the banks and their impending disruption, what about politicians? Do I really need to chose a geographically-bound representative who doesn't have a clue how the internet works, thinks breaking encryption is a boffo good idea and who hasn't even met me to be my representative in a parliament of like-minded folk? Can I not join another club? I'd rather influence the UK or US elections frankly, and on top of that, I've got no idea how you're going to raise taxes when I "reside" wherever I want and work in just as many jurisdictions. As the digital world becomes more important than the physical world - as we move to a model where we buy goods in from other countries, have laws thrust upon us by providers of services and generally lose our ability to influence the world via our laws, do we really need politicians who can only rattle their sables and mutter "now see here" instead of leaders who can deliver on a promise? If only there were someone in government who could talk about these issues and their potential impact on the country, on the economy, on our society and on our culture. NZ Herald -Juha Saarinen: Does the government want a techie CTO or not? 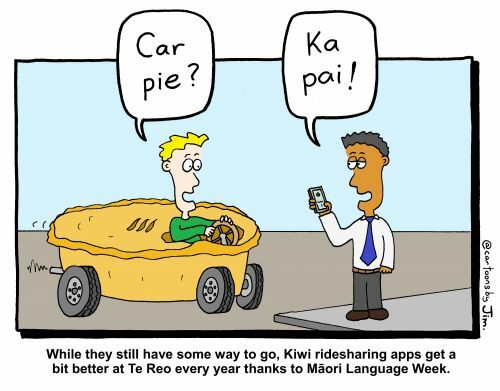 Māori language week is upon us and this year it's been bigger than I can recall it ever being. In years gone by it's been something of a quiet affair, but this year we've got newspapers finally using macrons, mastheads changing to Māori versions, we've got petrol companies telling us how to order coffee in te reo, and we've got apps, like Spark's Kupu offering, which lets you point your phone at an object and get the Māori word for it. It's exciting to see because language really is the heart of culture and having grown up in a culture that had saved its language (Welsh) I'm delighted to see another culture having a crack at keeping it real. This is the future we were promised, or at least the future hinted at in James Burke's Connections TV series (for those of you as old and as English as I am). In the future, he opined, we'd either settle on a culture we all shared, where a hotel in Bangalore is pretty much the same as a hotel in Los Angeles or Auckland or London or Karachi, or we'd build our own cultures and ensure they stand the test of time. I'd like to think we can take all the upside of being so remote from the world and put it to work in the digital space as Kiwis and stand apart from the homogeneity we see around us. The Americans might have tried to colonise our subconscious, but with some effort we can reclaim it and go our own way. And that's as good for our economic future as anything I've come across.